Contains £937 in play money! A simple effective way for children to learn how to use cash other than dollars. Includes 80 play notes of £5, £10, £20 and £50. 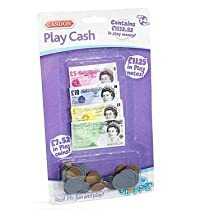 Also includes 40 play coins, 1p, 2p, 5p, 10p, 20p, 50p and £1 coins. The perfect compliment to any British shopping range.